24th day of the year with 341 days to follow (342 in leap years). 1848 James W. Marshall finds gold at Sutter’s Mill near Sacramento, marking the beginning of California Gold Rush. 1908 The first Boy Scout troop is organized in England by Robert Baden-Powell. 1924 Russian city of St Petersburg renamed Leningrad. 1933 20th Amendment to the United States Constitution is ratified, changing the beginning and end of terms for all elected federal offices. 1935 The first cans of beer are sold in the US (Krueger’s Finest Beer and Krueger’s Cream Ale). 1961 A bomber carrying two H-bombs breaks up in mid-air over North Carolina. The uranium core of one weapon remains lost. 1972 Japanese Sgt. Shoichi Yokoi is found hiding in a Guam jungle, where he had been since the end of World War II. 1978 Soviet satellite Cosmos 954, with a nuclear reactor onboard, burns up in Earth’s atmosphere, scattering radioactive debris over Canada’s Northwest Territories. Only 1% is recovered. 1984 The first Apple Macintosh goes on sale. 2003 The United States Department of Homeland Security officially begins operation. The first tourist threw his watch, but heard it crash before he had taken three steps. The second threw his watch and made only two steps before hearing his watch shatter. * St. Mom’s Wort – Plant extract that treats mom’s depression by rendering preschoolers unconscious for up to six hours. * Empty Nestrogen – Highly effective suppository that eliminates melancholy by enhancing the memory of how awful they were as teenagers and how you couldn’t wait til they moved out. * Peptobimbo – Liquid silicone for single women. Two full cups swallowed before an evening out increases breast size, decreases intelligence, and improves flirting. * Dumerol – When taken with Peptobimbo, can cause dangerously low I.Q. causing enjoyment of country western music. * Flipitor – Increases life expectancy of commuters by controlling road rage and the urge to flip off other drivers. * Antiboyotics – When administered to teenage girls, is highly effective in improving grades, freeing up phone lines, and reducing money spent on make-up. * Buyagra – Injectable stimulant taken prior to shopping. Increases potency and duration of spending spree. * Extra Strength Buy-one-all – When combined with Buyagra, can cause an indiscriminate buying frenzy so severe the victim may even come home with a Donnie Osmond CD or a book by Dr. Laura. * Jack Asspirin – Relieves the headache caused by a man who can’t remember your birthday, anniversary or phone number. * Anti-talksident – A spray carried in a purse or wallet to be used on anyone too eager to share their life stories with total strangers. * Ragamet – When administered to a husband, provides the same irritation as ragging on him all weekend, saving the wife the time and trouble of doing it herself. This next will kill Walt and Elmer with laughing. I keep getting medals for shooting. I don’t know why. The bulls-eye is near as big as a chipmunk head and don’t move, and it ain’t shooting *at* you like the Higgett boys at home. All you got to do is lie there all comfortable and hit it. You don’t even load your own cartridges. They come in boxes. The California Gold Rush caused a rapid increase of population in California! Sign in a Freshman dormitory . . .
– Don’t look at anything in the physics lab. – Don’t taste anything in the chemistry lab. – Don’t sniff anything in the biology lab. – Don’t touch anything in the medical lab. – Don’t listen to anything in the Philosophy Department. There will be no nursing home in my future……..
One day the pigeons needed to make a long trip. “What’s wrong?” said the mother. Sergeant: When you are scared, what do you do? Sergeant: Good for you. And now they shoot off your right ear…what then? Sergeant: Excellent. But now they also shoot off your left ear, what then? Recruit: Then I can’t see. Sergeant: Can’t see? what school did you come from? Recruit: Well sergeant, when both my ears are gone my helmet falls down…over my eyes. TODAY IN TRIVIA: Why do we call them “sundaes?” In the late 1890s, soda pop was a new invention and many people considered it as sinful as liquor. Evanston, Illinois, passed a law saying it was illegal to drink soda on Sundays because preachers felt sinners would spend the Sabbath in soda parlors instead of church. To get around this law, the Sundae was invented: take an ice cream soda and remove the soda and you have a sundae. It was originally spelled Sunday but was changed to avoid being sacrilegious. 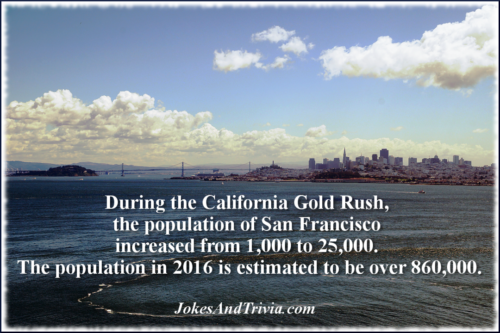 ~ How did people get to California during the Gold Rush? At that time there was no easy way to get to California and each route had deadly hazards. At first, most traveled by sea. From the East Coast, a sailing voyage around the tip of South America would take five to eight months, and cover some 18,000 nautical miles (33,000 kilometres). An alternative was to sail to the Atlantic side of the Isthmus of Panama, take canoes and mules for a week through the jungle, and then on the Pacific side, wait for a ship sailing for San Francisco. There was also a route across Mexico starting at Veracruz. Probably most well known today is the overland route across the continental United States, particularly the route known as the California Trail. ~ What were people called who went to California for the Gold Rush? Argonauts or forty-niners. Argonauts is a reference to the myth of Jason and the Golden Fleece. They sailed on the ship, Argo, and were therefore called Argonauts. Since many traveled by sea to search for gold in California, they too ended up with the nickname of Argonauts. As for being called forty-niners, that is an obvious reference to the year people starting pouring into California looking for gold.